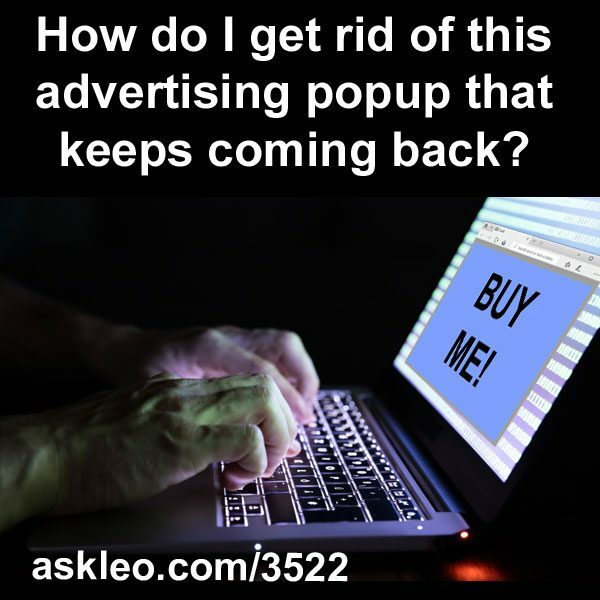 How do I get rid of this advertising popup that keeps coming back? - Ask Leo! How do I get rid of this advertising popup that keeps coming back? How do I get rid of this advertising popup that keeps coming back? - If your anti-malware tools removed the malware but this browser hijack keeps coming back, then you might be doing something to invite it back on to your system. How Did I Get Advertising About the Contents of an Email? - Sophisticated targeted ads can sometimes seem creepy. Here I explore how a few techniques work, and one I can't explain at all. Why does this malware keep coming back? - There are tools out there that can remove malware completely so that it does not come back. But it's worth taking a look at your own internet habits. « Previous post: How can I be “punished” for something I did not do? I have NEVER sent SPAM to anyone.